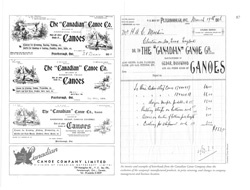 The history of the canoe building companies that were a significant part of the economic life of Peterborough, Ontario, for more than one hundred years is as rich and tangled a story as you’re likely to find in Canadian business history. Invention, entrepreurship, patents, lawsuits, rivalries, mergers, acquisitions, bankruptcies and catastrophic fires: it’s a tale that has all this and more. It is also a complicated story, and those who are interested in canoeing history, Canadian history, Canadian business history and the story of how the city of Peterborough, Ontario came to be synonymous around the world with the canoe will have a much easier time figuring it out after they have read Peterborough author Ken Brown’s new book: The Canadian Canoe Company & the early Peterborough Canoe Factories. This isn’t Brown’s first crack at the subject. 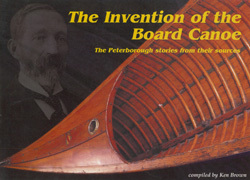 In 2001, The Canadian Canoe Museum published published his book The Invention of the Board Canoe: the Peterborough stories from their sources, which compiled primary source material to explore competing claims for the origin of the Peterborough area’s unique wide-board method of canoe construction. 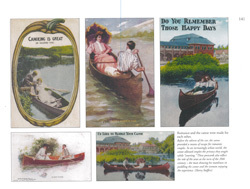 This first book was a modest pamphlet, which did invaluable service in clarifying an important part of the local canoeing story. It wasn’t, however, a book that you would be likely to leave out on your coffee table, or give to anyone but the most hardened canoe-head as a Christmas or birthday present (don’t get me wrong, this isn’t a criticism. I’ve read and enjoyed and used it, and I’ll be forever grateful that he wrote it.) With the publication of this new volume, which has been more than fifteen years in the making, Brown has really raised the bar. Now we’re definitely in gift and coffee table territory, and several people I know will be getting one for Christmas. Reading through this book and learning about the challenges that faced these entrepreurs as they developed their businesses, we are reminded that although the canoes they built are revered today for their craftsmanship, they were originally made in an un-romantic, hard-headed commercial environment. Brown has done an excellent job with the business history of this industry, not surprising considering that his working life was spent as a chartered accountant. This is an aspect of maritime history that is often neglected, and it is refreshing to see it treated in such detail. It also helps to bring the story out, for we see both the sucesses and the failures of these companies, both the good decisions and the bad. The book is amply illustrated and visually sumptuous, and publisher Karen Taylor and graphic designer Louis Taylor have done a fine job bringing the story to life. The 16 pages of colour plates at the end are a real treat, as is the back inside cover, which identifies the sites of companies connected with Peterborough’s canoe industry from 1858-1961. This map is particularly valuable because few of these structures are still extant today and these industries which were such a prominent part of downtown Peterborough for so many years are now invisible. 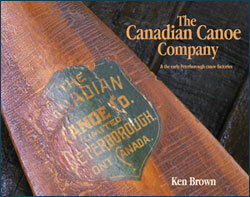 Highly-recommended and just in time for Christmas, The Canadian Canoe Company & the early Peterborough Canoe Factories is available from Cover to Cover Publication Services and from The Canadian Canoe Museum, which also carries The Invention of the Board Canoe: The Peterborough stories from their sources.